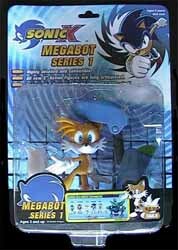 The Sonic X Megabot collection of action figures offers fans of the Sonic X series five quality action figures at a reasonable price. Cynics amongst you could argue that all that's being offered here is the original 5" figures that were released in 2005, but with the added incentive of a free robot if you buy them all. Nothing could be further from the truth. As well as introducing Amy and Shadow to the range, Spin Master has also used different moulds for each action figure - creating a new, revamped look. 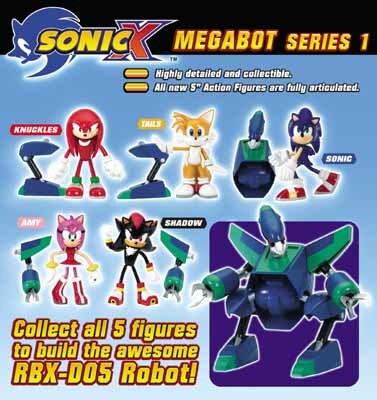 And while the addition of part of the Megabot with each figure may well have been a marketing ploy to get you to buy all five, all true Sonic fans will want to buy all five anyway. Tails comes complete with the Megabot's left leg. The only slight complaint I had was that the Megabot parts are pretty useless on their own. No thought has gone into fashioning them into weapons, or accessories that could be used with the individual figures. Surely, with a bit of tinkering, the arm sections (that come with Amy and Shadow) could have been transformed into jet packs, or guns. That aside, Sonic X fans will be impressed with these highly detailed and robust action figures.